The peacock is one of our more popular paintings. 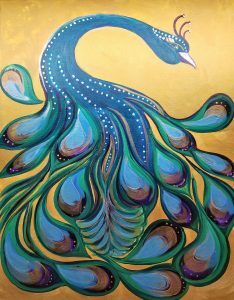 It’s rich colors and gold metallic background with pearlescent wing tips makes a stunning painting that anyone would want to hang. Enjoy time with friends painting this lovely painting on a fun Friday night out. BYOB and snacks. Painting starts at 6:30 PM.